Q. What’s included with the bike? A. 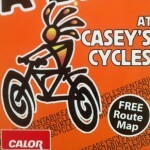 All bikes and equipment are fully serviced and include helmet, lock, repair kit, c/w pump, Hi-Vis vest and a route map. Q. What are the shop’s opening hours? A. Our shop is open from 9am-6pm Monday to Saturday and during the months of July & August, we are open on Sunday from 10am-1.30pm. NB. Arrangements can be made to open at other times too. A. No deposit is required but Photo ID IS required for the rental agreement. Q. What is the latest time a bike can be returned? A. The daily rate is for 24hours but arrangements can be made for returns up to 8pm each evening. Q. Can bikes be dropped at other locations? A. Bikes rented from our shop premises must be returned back to the shop. However, limited delivery and collection of bikes is possible but subject to an extra charge. Please enquire for details.